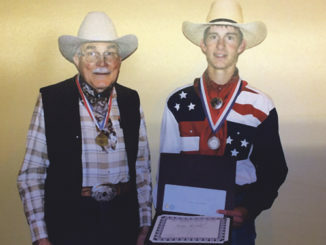 MEEKER — Bob Klenda, president of the Colorado Saddle Makers Association (CSMA) headquartered in Meeker, entered a pair of tapaderos and a breast collar in the World Leather Debut and won first place in two categories. The event was held in conjunction with the Rock Mountain Leather trade show, sponsored by the “Leather Crafters and Saddlers Journal” in May at Sheridan, Wyo. n Shane Deeter, boot and saddle maker from LaSal, Utah, won first place in the custom boot category. n Wolfgang Fay, CSMA member from Germany won the floral carved saddle category. n A Don King Memorial saddle contest was held. CSMA member and Vice President Jesse Smith, saddle maker from Pritchett, Colo., entered the open advanced class and placed second. Entries for these classes came from all over the world. Pete Gorrell, Jesse Smith and Bob Klenda, taught classes on fitting saddle trees to horses, saddle bag making and leather carving. Other CSMA members actively involved in the week-long event were Secretary and Treasurer Eileen Hendrickson and Correspondence Coordinator Kay Orton gathering information to share with CSMA members about their products. Harry Knipe of Grand Junction showed his invention, a rigging setter, an ingenious invention for placing the rigging to a saddle tree. Brock and Jayson Lynch, of Grand Junction, met with other saddle tree makers. For more information about the organization, contact Klenda at (970) 878-5382 or e-mail at bob@klendasaddlery.com.